What is the PPMT Function? 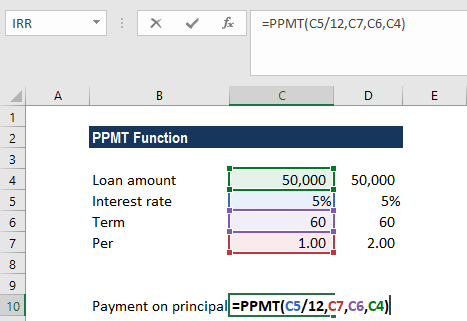 The PPMT Function is categorized under Financial functionsFunctionsList of the most important Excel functions for financial analysts. This cheat sheet covers 100s of functions that are critical to know as an Excel analyst. The function will calculate the payment on the principal for an investment based on periodic, constant payments and a fixed interest rate for a given period of time. 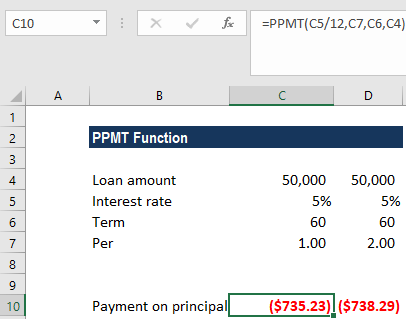 In financial analysis, the PPMT function is useful in understanding the principal components of the total payments made for the loan taken. Rate (required argument) – It is the interest rate per period. Per (required argument) – It is the bond’s maturity date, that is, the date when bond expires. 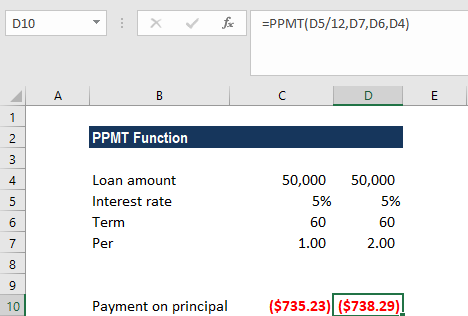 Pv (required argument) – It is the present value of the loan/investment. It is the total amount that a series of future payments is worth now. Fv (optional argument) – It specifies the future value of the loan/investment at the end of nper payments. If omitted, [fv] takes on the default value of 0. Type (optional argument) – It specifies whether the payment is made at the start or the end of the period. It can assume a value of 0 or 1. If it is 0, it means the payment is made at the end of the period; and if 1, the payment is made at the start. If we omit the [type] argument, it will take on the default value of 0, denoting payments made at the end of the period. 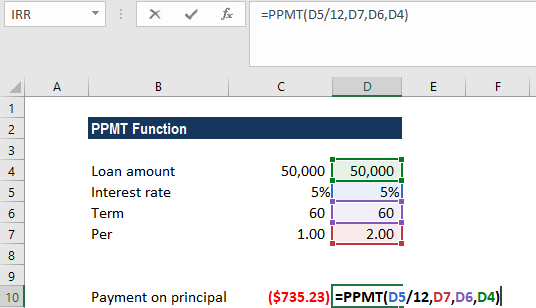 How to use the PPMT Function in Excel? We need to calculate the payment on the principal for months 1 and 2 on a $50,000 loan, which is to be paid off in full after 5 years. Interest is charged at a rate of 5% per year and the loan repayments are to be made at the end of each month. The formula used provides a reference to the relevant cells. We made monthly payments, so it is necessary to convert the annual interest rate of 5% into the monthly rate (=5%/12), and the number of periods from years into months (=5*12). Since the forecast value is zero and we need to make monthly payments, we omitted the FV and type arguments. We get a negative value, which signifies outgoing payments. #NUM! error – Occurs if the given per argument is less than 0 or is greater than the supplied value of nper. VALUE! error – Occurs if any of the given arguments are non-numeric. An error can arise if we forget to convert the interest rate or the number of periods to months or quarters when calculating monthly or quarterly payments. For the monthly rate, we need to divide annual rate by 12 and by 4 for the quarterly rate.